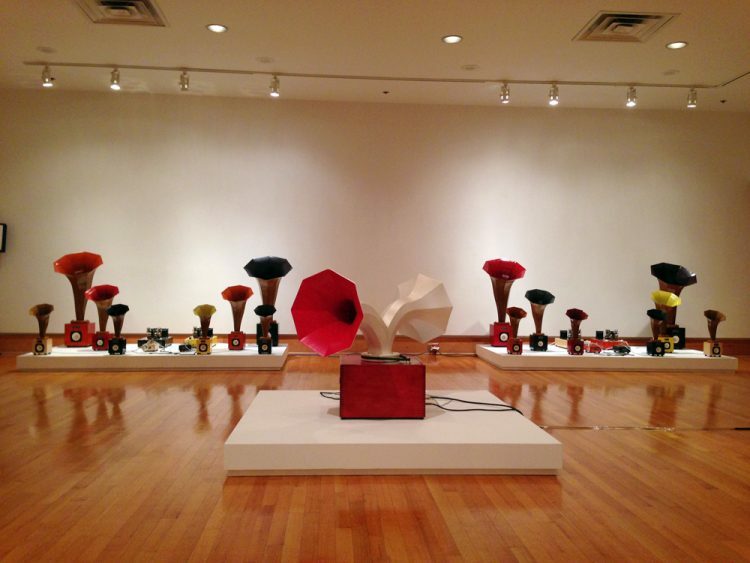 This exhibit was a unique sound installation of Specimen’s horn speakers, tube amplifiers, and spinning Aerosel sculptures. 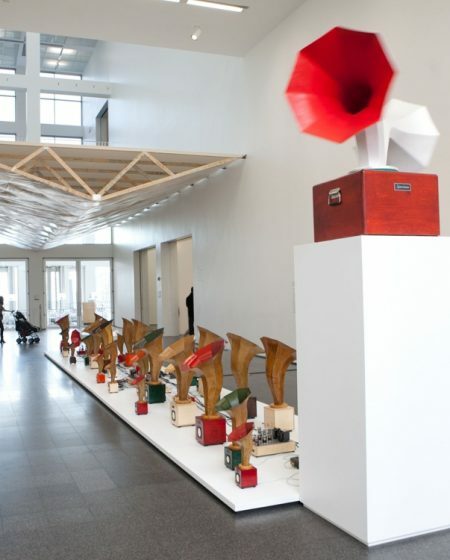 Thirty-four horn speakers are powered by 7 tube amplifiers connected to 10 Apple iPod Nanos. 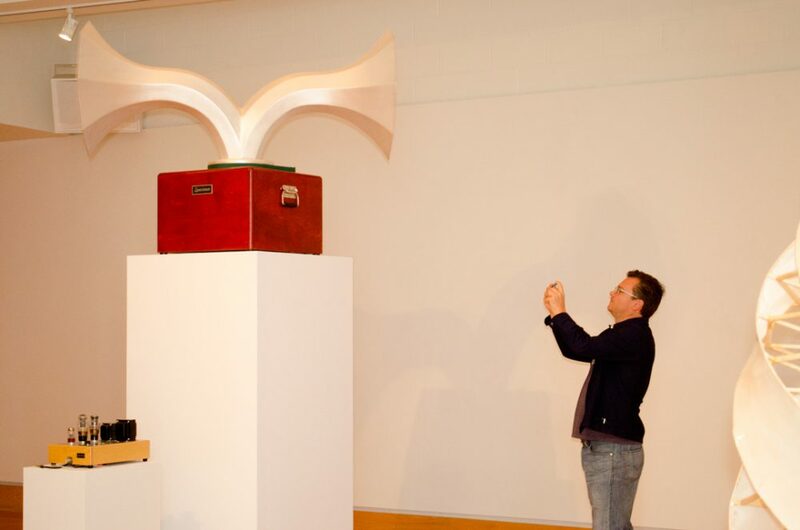 Each iPod contains specifically designated tracks of the entire musical score Andrew Bird composed exclusively for the 2011 Sonic Arboretum exhibition at Chicago’s Museum of Contemporary Art. 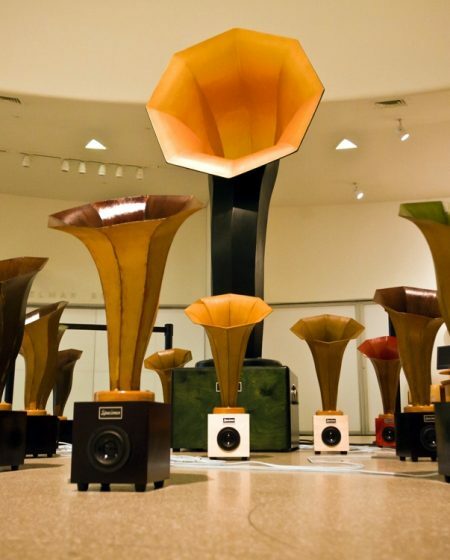 This co-mingling of 1940s tube technology with modern digital components creates an aural and visual installation that can only be experienced on location. I believe passionately in the utility and beauty of the electronic infrastructure that emerged in the 1940s. Many devices from that era were exploiting a newly discovered almost magical phenomenon – thermionic transmission (or electrons flying through space). The packages that housed these devices were carefully designed to preclude failure and be as serviceable as possible. Controlled thermionic transmission contained within a heated vacuum using chemically treated metal structures carefully juxtaposed within a glass envelope, or tube, came to represent the most linear audio device the world has ever known. 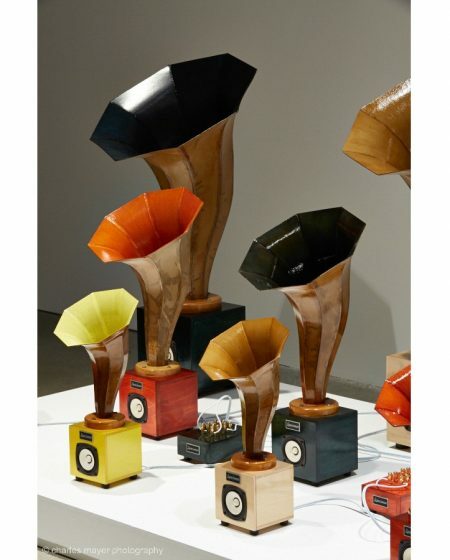 They were humble in power output, but more than adequate for use with efficient horn loaded speakers. I believe it is important to study this realm of audio history in order to gain perspective on what is taking place right now in the consumer audio market. There is an incredible contrast between these two manifestations. One is large, heavy almost to the point of immobility, yet constructed so it will never break down and can be easily serviced in the event of a discreet component giving up the ghost. They have easily accessible parts mounted solidly on turrets which can be soldered repeatedly without incurring damage from the heat. 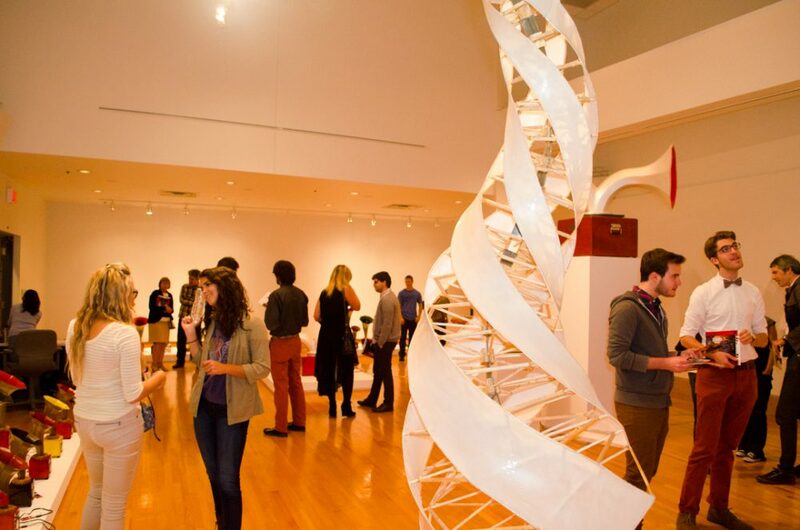 They also embody simple layout and design, minimal parts count, and uncluttered flow in the signal path. This makes for a solid performing circuit that can run for decades uninterrupted. It will probably last for many generations to come. This makes it an ecological home run. It never becomes obsolete or needs to be replaced. 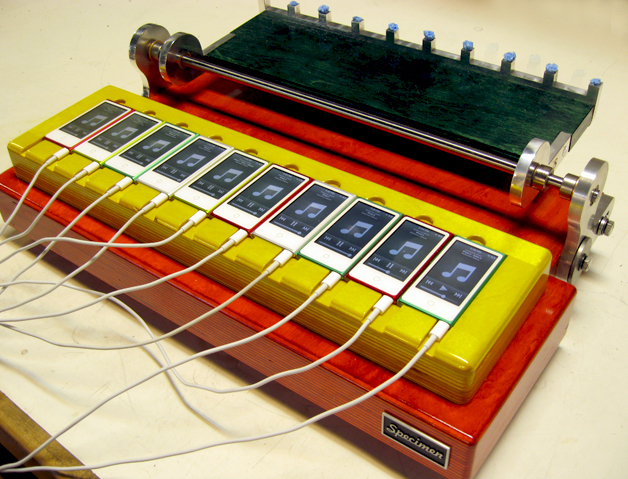 On the other hand, we have the modern manifestation of electronics like the iPod. Impressively tiny, amazing storage capacity, multifunctional, smart, and completely disposable by design – the marching evolution of technology renders them so, even if their infrastructure would accommodate a longer life. So we have a paradox at hand. We have a rock solid, yet elemental power source built for the ages which embodies the beauty of fortitude and we have a tiny miracle machine with endemic obsolescence. Our social fashion sense accommodates this because we are accustomed to changimg styles every year or even more often. 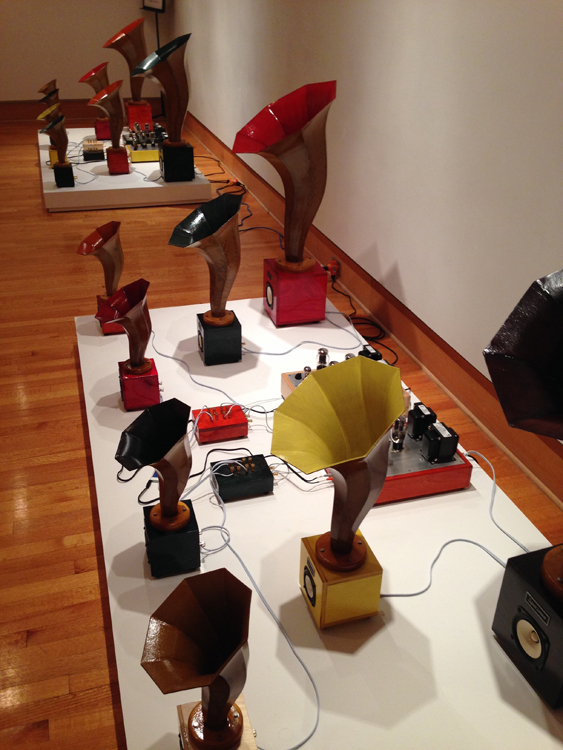 The Sonic Vignettes Exhibit took a step further to illustrate this contrast between technologies by using iPod Nanos as a 20 channel playback system. I created a device I call the Nano Sync Apparatus. My intention in creating it was to exemplify the two disparate worlds and perhaps begin to start an infrastructural dialog between the two extremes. The Nano Sync allows me to simultaneously start twenty tracks of audio and quickly ferry them out to waiting tube amps spanning an expansive gallery setting. 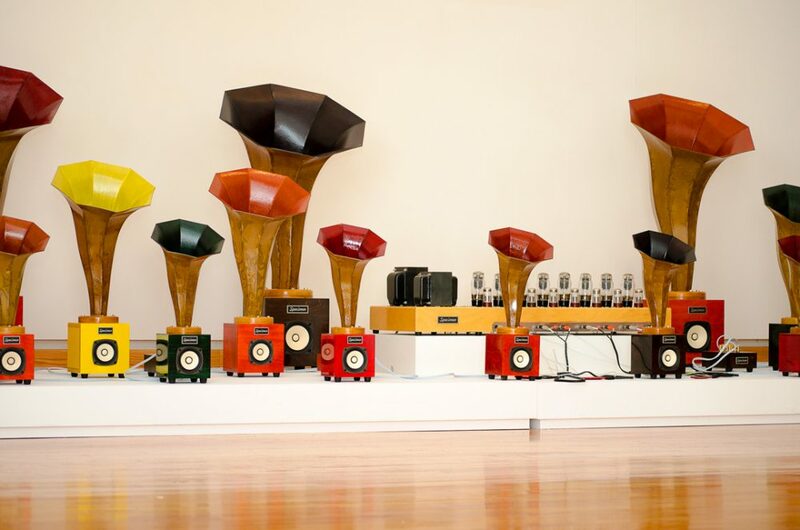 In this way we have the opportunity to experience a sonic landscape hitherto implausible but for the assortment of tube amps and horns everywhere in the room. Andrew Bird’s compositions stayed in sync for the entire month because the flash drives in the Nanos are rather accurate. The 2-1/2 hour playlist was stored on the Nanos as .wav files to maintain very good digital quality. We barely scratched the surface of their storage capacity. 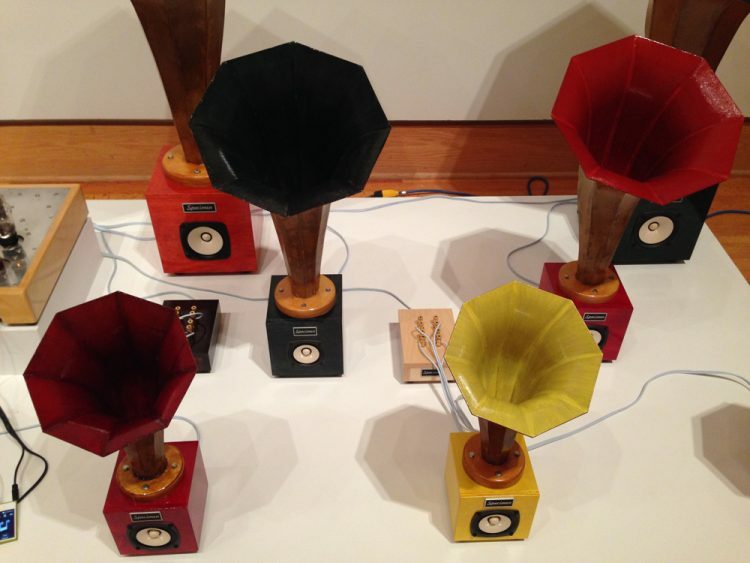 The tube amps and horns also help sooth whatever objectionable sonic effects might be derived from the digital format. To see the integration of the wonderful yet ephemeral digital playback devices with the tube amps and horns creates an intuitive lesson in history. A shocking representation of reality. An unlikely pairing of two kindred spirits at such opposite extremes of the spectrum. A forced yet easy symbiosis, with a simple trick of the hand. 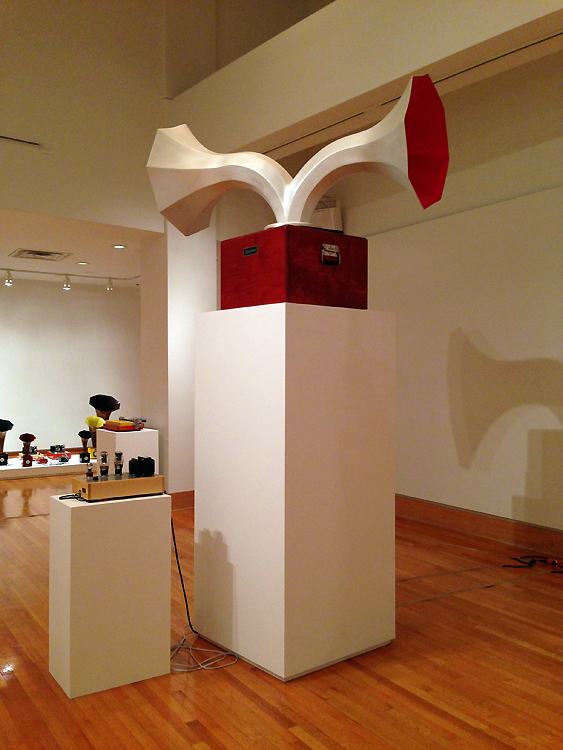 The Sonic Vignette exhibit ran September 24 – October 29, 2013 at Elgin Community College Art Center in Elgin, Illinois.